The University of Michigan Kellogg Eye Center opened its doors in 1985, consolidating under one roof clinics, laboratories and offices that had been scattered among seven buildings throughout the medical campus. The facility has since experienced exponential growth, as annual patient visits have more than doubled to over 160,000 since the building’s opening, making it Michigan’s number one ranked eye center. In response, U of M opened Brehm Tower, an eight-story, a 230,000-sq.-ft. addition to the center, in 2010. The Kellogg Eye Center’s journey to a First-Place finish began with a problem. The university had renovated several lab areas, including a whole floor, over several years’ time, converting them to office space. During the renovations, exhaust fans were not appropriately adjusted, and they continued to draw air for the 10-12 hourly air changes needed for the previous lab space. “Air was being pulled from every crack and crevice, and it found a different path when the new entrance vestibule was constructed,” explains David Shaw, U of M Medical School Regional Energy Manager. As a result, cold air pulled through the building entrance was chilling the main lobby area. To fix this problem, Shaw and the U of M Facilities Team worked to adjust the exhaust fans and rebalance the air flow throughout the building. By doing so, they reduced exhaust air by almost 10,000 cubic feet per minute (cfm). The adjustments also reduced the center’s energy consumption by 5.3 percent, for a cost savings of approximately $15,000 in the 2016 calendar year. A future exhaust fan replacement project will further reduce air flow at least another 3,600 cfm. The Energy Management Team’s five managers are now tasked with pursuing energy conservation projects throughout the entire campus, to help U of M reach its goal of reducing its greenhouse gas (GHG) emissions 25 percent by the year 2025. So far, the university has dropped its GHG emissions an average of 8 percent each year. Shaw advises other facility managers attempting to reduce energy consumption to first recommission their current facilities, to “make sure your facilities and equipment are doing what they were designed to do.” Secondly, it’s also smart to evaluate whether the facility and its equipment are meeting current needs, or if they are oversized. Thirdly, Shaw encourages facility managers to implement the latest technology and set up energy trends to monitor and control energy consumption. Pictured from left to right: Cheri Holman – USGBC West Michigan, David Shaw – University of Michigan, Connor Flynn – University of Michigan. Shaw says U of M was thrilled to be named “Biggest Loser” in the Health/Hospital category, viewing it as an acknowledgment of the university’s culture of leadership. 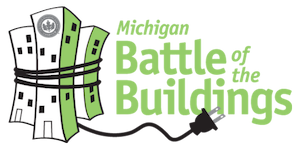 He credits the Energy Management Team, operations and maintenance engineers, design engineers, facilities maintenance, skilled trade personnel, and various contractors, all working together as a team, for the Kellogg Eye Center’s success in reducing its energy consumption and achieving its First-Place finish in the Michigan Battle of the Buildings.